?ber-geek Gary Gygax, creator of Dungeons & Dragons, is oft heard ranting in a surly manner about the use of the term "RPG." He laments that the video games dubbed "RPGs" by corporate marketing machines lack any semblance to the pastime whose name they've co-opted. Fable, a landmark effort from Lionhead Studios, succeeds where many computer RPGs fail; namely, it makes you feel like you're participating in the creation of a great story. 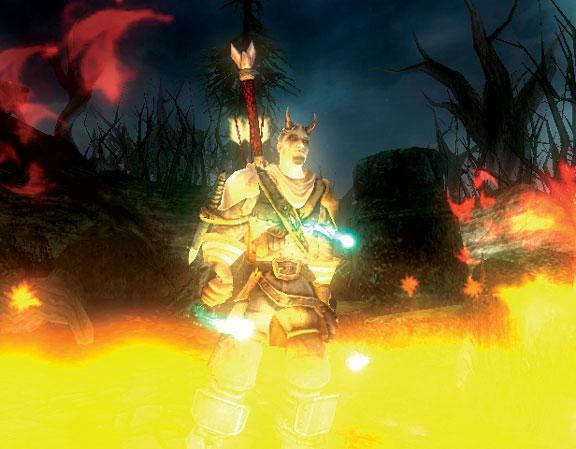 Though it contains many standard mythological archetypes, Fable gives players unique ways to interact with the story. A Sims-ish communication system provides the foundation for role-playing in Fable, with iconic expressions (laugh, flirt, sneer, etc.) that elicit physical and verbal reactions. Dialogue trees are non-existent, but characters with quest information deliver informative monologues followed by a simple yes/no choice. 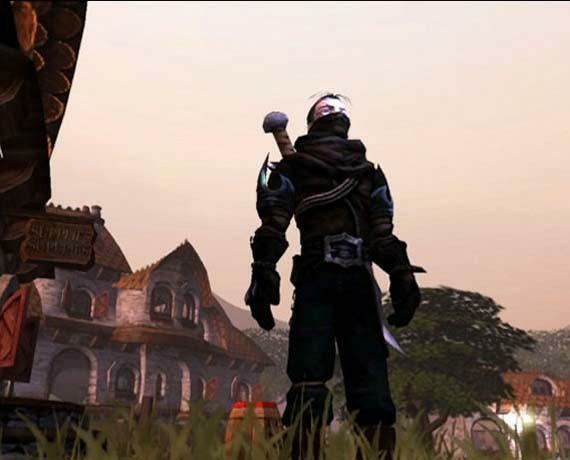 Rather than merely filling in a map and hacking up monsters, Fable encourages you to explore the fabric of social interactions that make up the game world. As time passes your character ages, scars, marries, buys a home, and gains renown. You're writing your own "hero's journey," and it can go just about any way you want. The game is structured around a main story, but you also have the option to accept side quests or just roam freely about the land. The freewheeling surprises are where Fable really shines, but even within the surprisingly short main story there exists a diversity of challenging obstacles and enemies. Before each quest, you're given the opportunity to make boasts that will earn you extra gold and renown. Common boasts include completing the quest without protection or weapons, or totally unscathed. At the end of major quests, you receive a trophy, which can be showed off for even more renown, and finally mounted on a plaque to increase your home's value. You can choose to quaff ale and play drinking games, woo maidens (or longshoremen) of virtue true, become a merchant or landlord, steal and kill for fun- the choice is yours but your decisions are not without their repercussions. Unfortunately, after a while most of the villagers start to feel one-dimensional and your interactions formulaic. For example, getting random townsfolk drunk and watching them stumble around is funny, but becomes an end unto itself rather than a clever way to, say, extract information or steal a wallet. Still, Fable provides entertaining anecdotal situations that people will enjoy telling each other about as they explore Albion's towns and wilds. There's a steep learning curve for the many complex controls, but the beginning stages of the game provide tutorials and opportunities for character back story. Though the renown system is the game's main innovation, combat definitely holds up its half of the sky. Melee and ranged attacks are available, along with a diverse offering of spells and weapon augmentations. Visually, Fable is a brilliant work of artistry that is perfectly accompanied by magical orchestrations (some by Danny Elfman) of joy and wonder. The only technical problems are in the controls, with occasional lags in responsiveness. Targeting spells and ranged weapons can also be problematic, but are on the money most of the time. Console RPGs are finally getting a healthy dose of actual role-playing. Fable champions the cause by creating a game in which building renown and developing your character's personality are paramount to combat and spell slinging. After four long years in the making, Fable can finally take its rightful place in the sacred canon of c-RPGs.